Ancestry has added the Missing Friends collection of advertisements from the Boston Pilot newspaper to its database. Between 1831 and 1920, the newspaper published some 45,000 adverts placed by families and friends of earlier Irish immigrants with whom they'd lost touch. Many of those who placed the adverts were newly arrived themselves; others were relatives still in Ireland, desperate to make contact. Submissions were received from well beyond Boston, and queries were made about immigrants living all over the USA. The published adverts often contain very useful genealogical data and, crucially, the townland of origin. Ancestry's version, indexed as a World Archive Project, holds 96,583 searchable entries. The images can also be browsed by year. Interestingly, place of origin details are provided when you carry out a free search (if they were published, obviously). It's only when you want to view an image of the advert that you require a subscription or pay-as-you-go credits. Dublin City Public Libraries will be closed on Saturday 3 August and Monday 5 August, reopening for normal hours on Tuesday 6 August. The National Archives of Ireland will be closed to the public on Monday 5 August and will re-open on Tuesday 6 August at 10.00. The National Library of Ireland Reading Room will be closed on Monday 5 August and there will be no Genealogy Advisory Service operating on that day. However, exhibitions at Kildare Street (Yeats and JFK) will be open 12pm to 5pm. The GRO Research Room will be closed on Monday 5 August, reopening Tuesday 6 August. Local branch libraries will be closed on Saturday 3 August and Monday 5 August, reopening for normal hours on Tuesday 6 August. Northern Ireland is open for business as usual on Monday 5 August but will be enjoying its own bank holiday on Monday 26 August. A collection of documents dating from the early 18th century is to be digitised thanks to a €45,000 grant from the Department of Arts, Heritage and the Gaeltacht. Among the material covered by the project is a collection of contemporary documents relating to significant historical events and movements such as the rebellions of 1798 and 1803, the struggle for Catholic emancipation, the Repeal Association and Young Ireland, the Fenians, the Home Rule movement and the Land War. The last written messages of a number of the executed leaders of the 1916 Rising, including the letter Pearse wrote to his mother the morning he was put to death. The collection makes up some of the most important paper-based documents held by the National Museum of Ireland. The digitisation project, which will be completed this year, also includes the Cashman collection, which contains over 200 photographs — many of them previously unpublished — of events and individuals connected to 1916 and the War of Independence. A number of historical artefacts relating to Roger Casement and Thomas Ashe will also be covered by the project, along with historical and military collections from the period after 1922. Cavan County Library's Local Studies department has been busily converting its collection to make it more accessible online. Valuation Survey of the Castle Hamilton Estate, published 1849. The Library recently restored this survey of the 2075-acre estate in Killeshandra. It examines the soil in detail in the townlands of Cordalea, Cornaclea, Derrygrid,Disert, Drumully East, Gortnanoul,Keelagh, Kinlagh,Kinkeel,Portaliffe, Portaliffe Glebe, Portaquin and Snakeel and includes high-quality hand-drawn maps. Registry of Freeholders in the County of Cavan 1825 (7814 entries), compiled by John Mayne and published in 1826. Statistical survey of the County of Cavan, by Sir Charles Coote; published 1801. The Life of William Bedell, DD Bishop of Kilmore, by Gilbert Burnett, Bishop 1643-1715; published 1736. Authenticated report of the Discussion which took place between The Rev. Richard T.P. Pope, and the Rev. Thomas Maguire in the lecture room of the Dublin Institution, on the 19th, 20th, 21st, 23rd, 24th, and 25th of April, 1827, by Rev Richard TP Pope; published 1827. Sketches in Ireland : descriptive of interesting, and hitherto unnoticed districts in the North and South, by Rev Caesar Otway; published 1857. Observations on the state of Ireland, principally directed to its agriculture and rural population : In a series of letters, written on a tour through that country : Volumes I and II, by J C Curwen; published 1818. Thomas Andrews, Shipbuilder, by Shan F. Bullock; published 1912. You'll find these, and plenty more titles, in Cavan County Library's Local History electronic catalogue. If you have Cavan connections, you really should check it out. UPDATE: Back in January, I announced details of two terrific new resources at the Local Studies department (news story here): The Farrell Loans Ledger and the Bellamont Estate Rental papers. Due to a lack of resources, these are still in the queue for digitisation but they're making their way towards the front!. I'll let you know when they've been uploaded. Northern Ireland's Department of Culture, Arts and Leisure (DCAL) has published Attitudes towards the Public Record Office of Northern Ireland which reports findings from the Northern Ireland Omnibus Survey April 2013. Nearly two-thirds (59%) of people had heard of the Public Record Office of Northern Ireland (PRONI). Those aged 16-34 were less likely than any other age group to have heard of PRONI. Single people, those from the Catholic community and those with a disability were less likely to have heard of PRONI than members of their corresponding groups. Fourteen per cent of respondents had had some form of contact with PRONI in the past. Fifty-five per cent of those who had heard of PRONI would like to see archives detailing historic events available online, while just under half (49%) would like to see photographs online. Just under one in every five (19%) who had heard of PRONI stated that they were prepared to pay to access online archives. Thirty-seven per cent stated that paying for records online would depend upon the charges while over two-fifths (44%) were not prepared to pay for online records. Fifty-five per cent of those who had heard of PRONI would like to see archives detailing historic events made available online, while just under half (49%) would like to see photographs. Four in ten people (40%) would like to see church records online, while 37% would like to see school registers. Around a quarter of those who had heard of PRONI would like to see hospital records (27%), workhouse records (26%) and pre 1858 wills (23%) made available online. 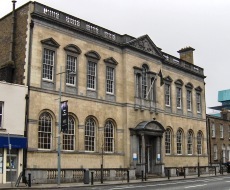 Cavan County Museum is planning a new exhibition to tell the 'Story of Emigration from County Cavan'. A provisional date for opening has been set for Wednesday 7 August, but this may be pushed back as the team is still collecting memorabilia for display. If you have suitable memorabilia, please contact Danielle or Savina at Cavan County Museum by email or telephone 00 353 (0)49 854 4070. Bunratty Graveyard 1783–2011: This record set contains 395 transcriptions of headstone inscriptions. Each memorial has been photographed and the transcriptions have been arranged in alphabetical order of surname. A map identifying grave locations and numbers is also available. The collection was donated by Clare Roots Society. Kilreedy Graveyard: Located in Tubber, on the north-eastern edge of The Burren, most of the burial plots in this graveyard are marked by uninscribed stones or are unmarked. The oldest headstone recorded in this small collection of just 34 transcriptions dates to 1706. It was donated to the Library by Dierdre Keane. Kiltacky Graveyard: Close to Kilreedy, Kiltacky graveyard holds 18th, 19th, 20th and 21st-century examples of graveslabs and headstones, including many uninscribed stone markers. The oldest inscription in the graveyard dates from 1794. This collection covers 151 burial plots and a map, and was donated by Claire Keane. 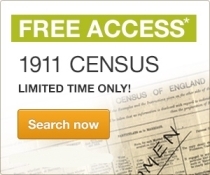 Ancestry.co.uk has recently upgraded its version of the 1911 Census for England & Wales so it's going to offer free access to tempt you to take a look! The offer is live from today and will run until 14 October. You need to register with name and email address, but there's no requirement to give credit card details. The General Register Office's bright, well-appointed and conveniently located Research Room at the Irish Life Centre, Talbot Street/Abbey Street Lower, Dublin, is to close when its current lease expires at the end of August. 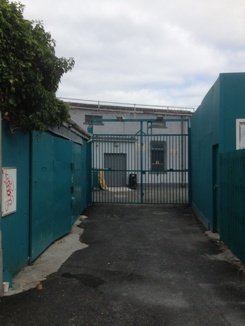 The current facility is close to Connolly Station, LUAS, DART and many bus stops, and is just a stone's throw from O'Connell Street. To the benefit of genealogists, it’s also next to the Valuation Office, where information about ancestors’ land holdings can be traced back to the 1850s. The Research Room will reopen in a delapidated former Dole Office on Werburgh Street. The office is currently protected by high security fencing topped with barbed wire. When asked about the move Steven Smyrl, President of the Association of Professional Genealogists in Ireland (APGI) and executive liaison officer for the Council of Irish Genealogical Organisations (CIGO), described the proposed move as 'appalling'. 'Given that this is the year of The Gathering, it’s about as unwelcoming as it could possibly be. All the outward signs suggest an area riddled by crime and antisocial behaviour. If the Government wants to demonstrate its belief that genealogy has a role to play in our economic recovery and if new premises must be found soon, the underused Dublin Tourism Centre in St Andrew’s Street would be one ideal location. The city is full of unused office space without the need to dump Ireland’s ‘Mecca’ for roots tourism in an unsavoury side street. Thousands visit the GRO's Research Room each year. Rather than having to fight for the facility to stay at its current location, family historians would like to hear that the GRO is listening to their needs and will finally allow public access to its computerised database of birth, death and marriage records, which date back to 1845. Currently, researchers must wade through individual annual hardcopy indexes, and searches over many years can be very time consuming. UPDATE 20 July: The Irish Times has taken up the story. The move is being billed as 'temporary'. See blogpost. UPDATE 13 September: Move has still not taken place. See blogpost. Ancestry has added a new database of New York Naturalisation Records. This collection of some 1.2million records filed in various federal, state, and local courts in New York dates from 1794 to 1906 and includes many, many Irish emigrants. Further details from Ancestry: The first step for an immigrant wishing to become an official U.S. citizen was to complete a Declaration of Intention to naturalize. These papers are also known as First Papers as they are the first forms to be completed in the naturalization process. Generally these papers were filled out fairly soon after an immigrant's arrival in America. After the immigrant had completed these papers and met the residency requirement (which was usually five years), the individual was able to submit his Petition for Naturalization. Petitions are also known as Second or Final Papers because they are the second and final set of papers completed in the naturalization process. Immigrants also took a naturalization oath or oath of allegiance. These oaths are often filed with the immigrant's first or second papers. After an immigrant had completed all citizenship requirements he was issued a certificate of naturalization. Many of these documents may be found in the court in which they were created. A project to record details from memorial cards has been launched in County Kerry. It hopes to emulate the success of a similar project in neighbouring County Clare (details here). Memorial Cards for anyone who died in Kerry. If you would like to contribute memorial cards from your family, you should scan the front and back of the originals and send them by email. You can also, if you wish, provide a contact email address to which potential family members could be directed.. Details from the submitted memorial cards will be held on a database that may, in time, be made available for searching online. In the meantime, enquiries can be sent to the email address above. If only all inscriptions were so comprehensive! DiscoverEverAfter, the graveyard surveying company based in Portglenone, Co Antrim, has been busy in recent months carrying out surveys in churchyards across Northern Ireland. The results of those surveys have now been uploaded to the website for free searching. It brings the total number of burial records on the site to 100,504. The records of St Joseph's Cemetery in Carrickmacross are now available for free searching via Carrickmacross Workhouse website. The formal launch of this dedicated section of the website, which includes historical information, maps etc of the cemetery, will take place this afternoon at 3pm during a Community Afternoon at the Workhouse. The majority of the 1,313 plots in the cemetery are marked by a gravestone; the earliest legible inscription dates from 1866. A record search returns plot number and location, a transcription of the full inscription, a large photograph and a description of the grave marker ie 'Limestone Celtic Cross on Large Plinth - Iron Railing'. While this is obviously good news for researchers with ancestors from the town, family historians with connections to other parts of County Monaghan, and even across the border into County Louth and County Cavan, should also take note as records from a good number of burial grounds in the area will be joining those for St Joseph's. There's no mention of timescale but you can see the list here. The Open Days are organised as Drop In events where you can meet and receive research advice from professional genealogists including John Grenham (author of Tracing Your Irish Ancestors) and take advantage of free searches on online family history resources. 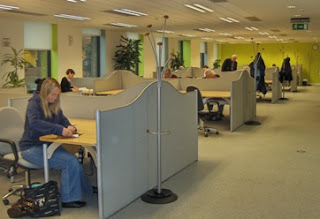 A number of Irish family history organisations, including the Association of Professional Genealogists of Ireland (APGI), the Irish Genealogical Research Society, the Irish Family History Society, the Genealogical Society of Ireland and Ancestor Network, will have information stands, and Dublin City Libraries & Archive will be showcasing its wide range of genealogical resources. The Open Days will be held 10:30am to 4:30pm on each of the Fridays. Everything will be free, and it's a great opportunity for beginners, experts and tourists to start exploring or progress their family research. More info: www.dublincitypubliclibraries.ie. Tel: 00 353 (0)1-6744870 or (0)1-6744800. FindMyPast Ireland has added the 1858 Medical Directory for Ireland to its searchable database. It details the locations and published works of professionals holding qualifications as either apothecaries (pharmacists) or medical doctors in Ireland. This was the year in which a Medical Act started to regulate the medical profession and to drive out unlicensed practitioners. There's more information about this Directory and its compilation here. The first directory of Ireland's medical profession, which was published in 1852, is also available. These and all FindMyPast Ireland records are also available via a World Subscription with FindMyPast USA, FindMyPast Australia/NZ and FindMyPast UK. Portlaoise Library has launched a series of lectures called ‘A Celebration of Architecture: the Big Houses of Laois’. The lectures, all to be held on Tuesday evenings, feature houses spanning 1699 to the 1820s. For details contact Portlaoise Library 00 353 (0)57 8622333, or download the programme from the library's website. 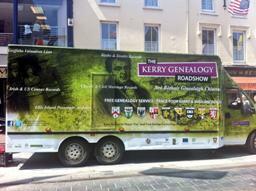 Prepare to turn green with envy (again) all ye who don't have Clare ancestors! You may remember me raving about a new map overlay system developed by Clare County Library back in January last year. Well, they've not left it alone. The latest incarnation of this resource – to be known as GenMaps – has created THE MOST sensational maps resource that not only overlays modern maps onto historical maps, it can now map surnames into hotspots. Searching by surname, the software creates heat maps where clusters or instances of the name appear in either the tithe applotment books 1820-40, Griffiths Valuation 1855 or the 1901 census. Not content with that, you can then zoom into the 1842 6" ordnance survey map and overlay it with a modern road map and satellite view. Switching between the two is simple. 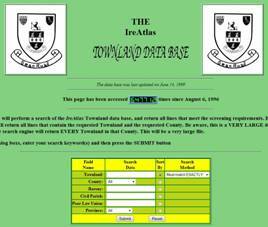 As and when you want to find out more about a particular townland, you simply click on the location and a host of additional information, from external sites as well as the Clare County Library site, can be checked out. There's a very useful video tutorial to get you started on the Surname Finder. It's great fun. Go play, whether or not you've got Clare ancestors! As I'm currently laid up with a slipped disc (hope to be back to normal output next week), I've been reading quite a lot, so this post is rather timely. My subscriber copy of the latest issue of HistoryIreland was, as always, a welcome sight on the doormat. The magazine is also now in the shops. You can't miss it! It's got a very distinctive cover, in fire-engine red, with a graphic of Jim Larkin in characteristic pose. You'll quickly get the message that this is a special edition dedicated to the Dublin Lockout of 1913. Among the features are studies of the main protagonists – Jim Larkin and William Martin Murphy – and their portrayals as hero and villain, the conduct of the Dublin Metropolitan Police, the role of the Jacob's Biscuit Factory, and the after-effects of the Lockout on subsequent labour relations in Ireland. There are also context features and in-depth articles about the Belfast dock strike of 1907, the Wexford lockout of 1911, and similar contemporaneous labour disputes in the USA. Even the Regular pages keep the focus; the Gems of Architecture's target is Liberty Hall, while the Book Reviews relate to books on industrial and social developments of the era. A terrific read. And only €7/£6. Hurry, hurry. The editor of Irish Roots magazine, which is published in both print and digital format, invites you to enjoy last December's issue (number 84) absolutely free. 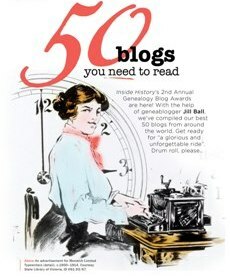 As always, this issue holds several features exploring family history resources and how to get the best from them. Among them is the final (4th) part of the Tracing your Ancestors Online series, which looks at where and how to uncover records using gravestone inscriptions, military records (both British and Irish) and crime and court records. There's also some very useful advice on the four worst things you can do to photographs in the name of preservation, a thorough introduction to the Petty Sessions Court records collection now available at FindMyPast and an indepth tutorial on finding Irish relatives in America. You need to get on with it if you want to take up this opportunity. The offer to read the issue free will expire on Friday 12 July. The July issue of this monthly digital-only magazine is now available to download free of charge. County Donegal is the focus of this issue's main genealogy resources section with listings of collections held by the local libraries and archives, a study of the surnames associated with the county, and an invitation to the Gallagher Clan's Gathering. Elsewhere, there's a major feature about the recent Obama visitation and their family history, and personal family tales of ancestors from Cavan and Sligo and Kerry who emigrated to New Jersey and Nova Scotia. There's also the final part of a series about researching 'missing' ancestors in Australia and New Zealand, and an analysis of a wonderful photo dating from c1880 of a coach full of passengers in Galway's Eyre Square. You can download or read the issue online here. Every now and again a little bit of gold falls into my Inbox! On this occasion, it's come via Colin of Liverpool. 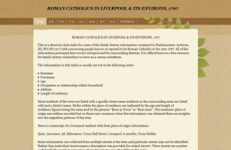 It's a fantastic new online resource for those whose ancestors found themselves in Liverpool in 1767 (or surrounding district) and were recorded in the Papist Returns, one of a series of polls of known or reputed Roman Catholics ordered by the British Parliament between 1680 and 1781. Duly returned to the House of Lords, the documents were retained in the Parliamentary Archives. In most of these polls, individual names were not recorded, but there are several examples of those taken in 1767 when much more than names were collected. Liverpool was one such. In addition to full names, typically of all family members, the returns recorded ages and occupations, and, in some instances, length of tenure at the particular address and sometimes even place of origin. Many of these Roman Catholics would have been Irish, whether they are recorded as such or not. The 2,000-odd entries in the Liverpool returns have been transcribed by the otherwise anonymous Blue70, a member of the Liverpool & South West Lancs Genealogy Forum and placed on a dedicated website for free access (click image). Big round of applause to Blue70. Great work. Since we're now well into the summer holiday period, the number of events taking place has shrunk quite dramatically. Thank goodness for the National Library of Ireland's Summer Genealogy series (Tuesdays and Thursdays throughout July and August); it'll help to see us through what would otherwise be a lean time. Don't forget that most of Northern Ireland closes the door of normality on Thursday afternoon (11th) and doesn't re-emerge until Tuesday next week (16th). All Libraries*, GRONI and PRONI will be closed. Until Saturday 13 July: Irish Historical Maps, on display at Terenure Library, Templeogue Road, Dublin 6. Free. Opening hours. Tuesday 9 July: Ireland’s Quakers and their records, with Christopher Moriarty, Dublin Quaker Library. Venue: Seminar Room, National Library of Ireland, Kildare Street, Dublin 2. 1pm. Free. No booking necessary. Tuesday 9 July: The Shamrock Fund in WW1, with Brian White. Host: Genealogical Society of Ireland. Venue: Dún Laoghaire College of FE, Cumberland St, Dún Laoghaire, Co Dublin. €3.00. 8pm. All welcome. Wednesday 10 July: Violence, Politics and Voice: Irish Catholics in London and the Troubles in Northen Ireland, 1970-1981, with Sean Sorohan. Irish World Heritage Centre, Manchester, UK. 7:30pm. Details. Thursday 11 July: Is there a doctor in your house? Family history records in the Royal College of Physicians of Ireland, with Harriet Wheelock, RCPI. Venue: Seminar Room, National Library of Ireland, Kildare Street, Dublin 2. 1pm. Free. No booking necessary. Saturday 13 July: Mayo Genealogy Group Workshop at the National Museum of Ireland, Country Life, Turlough, Castlebar, Co Mayo. A monthly drop-in event for family history advice and chat. No booking required. Free. Details. Sunday 14 July: Arbour Hill church and graveyard, Dublin, a guided tour with Paul O'Brien. 12noon. Booking essential as places limited. This tour is carried out in conjunction with the OPW as part of the Communities Initiative. Details and booking. *LinenHall Library will be closed 11, 12 and 13 July; open Monday 15 July. The Representative Church Body Library has released the 1913 Church of Ireland Directory as its Archive of the Month. This Directory provides an insight into the Church on the eve of one of Ireland's most pivotal decades, and, when read in conjunction with the first edition published in 1852 (and also online, here), reveals the huge changes the Church had undergone since dis-establishment. As you'll see if you follow the link, the 1913 editions of the Church of Ireland Gazette will be going online at the RCBL website next month.